About a week ago, Jesse Dean posted an exemplary article on Board Game Geek, ‘A Few Acres of Snow and the Critical Silence on the Biggest Flawed Game of 2011,’ discussing the weakness of much board game criticism. As an example, he highlighted the fact that celebrated reviewers have failed to address a problem in Martin Wallace’s A Few Acres of Snow, whereby the player playing as the British can (it is said – I haven’t played the game) always win by attacking the city of Halifax in a particular way – a strategy first highlighted by Michael Fritz. While other examples may have helped Dean’s case, the article argued well that a focus on early reviews can allow serious design flaws to go under-acknowledged. Many good points were also made in reply. With 313 responses (so far), there’s no way I can summarize everything, nor would I want to do so. One interesting strand which arose in the discussion, however, concerned the number of times reviewers play a game, and how many they ought to, before reviewing it. A line of reasoning argued that, had reviewers played A Few Acres of Snow more before writing about it, they may have discovered the Halifax Hammer, as it is known, and therefore been able to highlight it in their reviews. 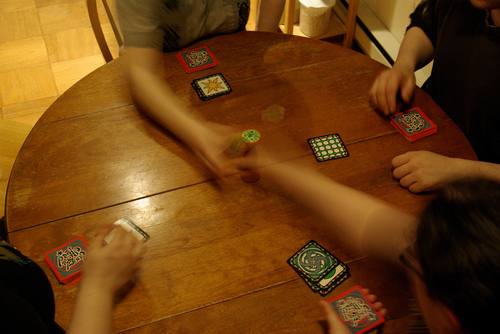 More generally, reviews written after multiple plays were widely seen as better: One contributor, Tim Seitz, highlighted his own review of Dominion written after 200 plays as something of an example. I cannot follow Seitz in viewing this as the answer, though. I do not wish to mischaracterize his point by suggesting he implies all games should be played such a high number of times before being reviewed: this I presume not to be the case. But, if repeated play were to be valued too greatly, discussion of games would either stagnate, or become pernicious: there really would be a critical silence about new games, and any commentator who broke ranks to speak early would face chastisement for addressing a game before he or she could legitimately claim to have understood it (whatever can be meant by that). Nevertheless, there is a problem that speed of reaction is, often, valued more than quality of reaction. The most lauded reviewers tend to be those who react earliest, whether their early views match later consensus or not. In short, I share the desire of Dean and Seitz for better criticism, but do not tie this to reaction speed to the extent each apparently does. There is scope for a well-expressed, insightful early reaction: Scott Nicholson’s in play videos stand as evidence of this, for me – even in this on-the-fly format, his analytical ability and communicative talent are clear. Obversely, some of those who produce the weak early responses in question would still lack clarity and insight if they commented on a game later: Not all possess the talent for lucid explanation of their thoughts and feelings. The answer to this is not to disregard entirely those whose primary interest is in providing an early reaction: though often these analyses are superficial, through gauging a breath of early comment, I think it’s possible to reliably gauge (though not unfailingly) if a game is likely to suit my tastes. That, though, is a skill which it has taken me time to acquire: finding the thought through the noise is difficult. Instead, I think those with an interest in producing deeper criticism need to celebrate and support one another, rather than criticizing speedier and more superficial commentators. Building on, referencing and commending one another’s work would be a start – it would let credit for insight find the correct recipient, while allowing commentators to push one another further, rather than continually restarting from first principles. Of course, this depends on those commentators knowing one another in the first place: a problem I’m working on means to address. One part of the equation might also be readers taking quick-reactions with a grain of salt. Good thoughts here. Your thoughts echo mine. I ranted about this a while ago, and then followed that up with some of my opinions on what makes a good game review as well. In the particular case of A Few Acres of Snow, however, it would very likely be possible that a reviewer who had played a significant number of times may still not have stumbled upon the “flaw” in the game, so it doesn’t really seem like a good example to me. The “Halifax Hammer” was more discovered through hundreds of plays online than it was in the first dozen or so plays face-to-face. But in general, it also irks me to no end that all of the “first” reviews get so much attention while the later, usually more thoughtful ones get almost no regard at all. Sometimes, I get frustrated with myself in how slow I am to write reviews, but I just can’t even make myself write about a game until I actually feel like I truly understand it, which a lot of reviewers don’t seem to care about at all. Very true, Philip. If a review appears within a week of a game’s release, I doubt the typical reader approaches it expecting faultless strategic analysis. Similarly, if I buy a game on the basis of a gushing early review, I cannot be too bitter at the reviewer if the novelty of the game wears off quickly. Chris, I like your five points for writing good reviews. In particular, I think the point that a review is an opinion piece is valuable (and though it should be obvious, many reviews are practically rulebook rewrites, with only a paragraph or two of actual criticism, as you rightly say). Nonetheless, I do accept gut reactions and early comments as important parts of the critical conversation. I wouldn’t want to mute those who are excited enough about a game (whether their reaction is positive or negative) to comment upon it straight away. There are a couple of games on the horizon I’m quite interested in, and once they are released I’d be very glad to hear any first thoughts people have. But yes, as a community, we need to be better at celebrating our best speakers, in addition to (rather than to the exclusion of) those who are first to open their mouths. You’re right, a “first impression” review (particularly when they’re written from a convention where you may have only played it once) still has its place. But I would prefer that those either be labeled as session reports or have it be very clear that it is a first impression from only a single play. Heck, I write reports from my regular game nights all the time and include mini “reviews” of pretty much everything I play. But I’m also transparent enough to be clear about how much experience I have with the game and usually self-depricating enough to refuse to claim any sort of authority about my opinions until I feel very comfortable that I understand the game about as well as I can. I think they still have a lot of value because of the process I use, but also leave open a lot of room that my opinions could easily change as I experience more of the game. I probably take the idea of a “review” a little too seriously, but it’s mostly in reaction to all the people who seem to throw around the term even when they have but the barest of understanding of the game rules, let alone any sort of depth of experience with it. And in regards to my 5 points… Yeah, I also have an issue with people who try to teach all the rules to the game, tag on “I like it” to the end and call it a review. Frankly, that’s why I think that video reviews (for the most part) are practically worthless. If I want to spend 20 or 30 minutes learning how to play a game, maybe I’d want to watch, but to actually get opinions on whether or not I’d maybe like it or want to buy it, give me the high points and spend more time on your opinions.